On Wednesday night, T-Mobile CEO John Legere passed along some numbers, detailing the State of the Carrier. According to the executive, the mobile operator's LTE signal reaches 227 million Americans, and that number will hit 230 million by the end of this month. 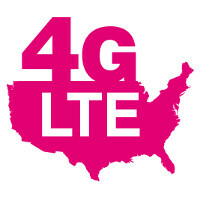 By the end of the year, 250 million Americans will be covered by T-Mobile's 4G LTE signal. In 2015, the carrier's LTE rollout will be complete. In addition, T-Mobile's CEO announced that the carrier now has its VoLTE service available in 16 markets. That includes major metro markets like New York, Chicago and Los Angeles. Later this week, an update to the carrier's Samsung Galaxy S5 will add support for VoLTE. That would mean that 4 of the handsets offered by T-Mobile (LG G Flex, Samsung Galaxy Light and the Samsung Galaxy Note 3, in addition to the Galaxy S5) support the voice over LTE feature. Currently, 100 million T-Mobile subscribers can use the service. With 15+15MHz and 20+20MHz channels in use by T-Mobile, the carrier says that its VoLTE service has a theoretical peak speed of 150Mbps. I don't really understand this last sentence. What does VoLTE have to do with 15X15 or 20X20 MHz channels? Isn't it supposed to work on any LTE speed as it is just a voice over 4G technology? VoLTE requires some specific LTE implementation/equipment on the carrier side and that devices undergo some testing. It is not specifically related to the channel configuration. "Last month, I shared that we were the first to roll out Voice over LTE (VoLTE) and as of today, we’ve launched VoLTE in 15 markets and have more VoLTE devices than anyone else – now covering more than 107 million Americans. And, we expect to deliver nationwide VoLTE before the end of 2014. Because our network has been designed for data, we’re now able to nearly double the data that supports voice calls for superior, crystal-clear HD Voice. In fact, we offer the highest fidelity HD Voice possible -- 23.85 Kbps voice codec rate. VoLTE also offers faster call set-up times than a non-VoLTE call and customers are able to access our LTE network during a voice call." http://newsroom.t-mobile.com/issues-insights-blog/the-un-carrier-network-designed-data-strong.htm Also, as of tomorrow, T-Mobile will start supporting VoLTE on the Galaxy S5 which is some good news for many Samsung owners. I was really hoping that the taxes and fee's rumor was going to be announced tonight, but it wasn't... I guess a false rumor? I was definitely going to switch w/ that and everything else they announced tonight, but I'll hold off for now. You should know by now to take every rumor and speculative article from PA with a grain of salt. Wiser words may never have before been spoken on this site, Mxy. for real ? or "technically" ?